Making a deal with the devil for your own greater goods. Once the decision at the crossroads is made, there is no turning back. He got in bed with Adolf Hitler and his regime. It enabled him to create grandiose neoclassical architecture on a scale that will remain unrivalled for aeons to come. For Speer, the end seemed to justify the means, however, the book follows the guiding question architect Le?on Krier raises, i.e. how does being a war criminal align with being an artist? 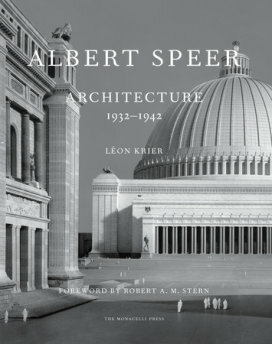 Instead of being merely a catalogue of his oeuvre, Albert Speer: Architecture 1932-1942 is much more as it goes beyond face value and generally critically sheds light on the (inter)dependencies of money, art, politics and the yin and yang informing it all, culminating in the essential question it art, no matter how significant, can be seen stripped off the political backbone and context and if, in Albert Speer’s case and circumstances, it has any merit at all. Krier’s tenet is achieved by drawing on interviews with Albert Speer as well as his involvement and role in the third Reich and the evaluations of experts. An essential, lavishly illustrated tome that manages to strike a well-calibrated balance between documenting and critically questioning and one that speaks for the quality of Monacelli Press’ releases, which span from comprehensive works on architecture, interior design and décor, fine arts, fashion & stile to world history and culture.